Year of maximum is wrong. Dr Hathaway has maximum in 2013. It will be in 2015, as foretold by the green corona intensity, and halfway through a 12 year solar cycle that started in December 2008. Based on the rate at which Dr Hathaway is approaching a correct prediction, we can now estimate when he will finally make a correct prediction. That will be in 2012. In the spirit of the Hockey Team, I will now make a prediction based on an interpretation of someone else’s as yet unpublished work. That prediction is that there will be no reversal of the Sun’s magnetic poles at Solar Cycle 24 maximum. 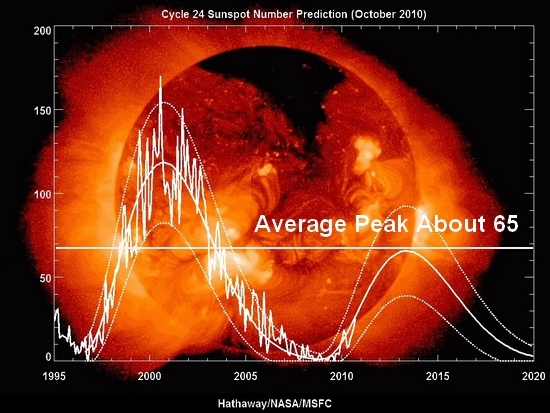 In hindsight on Solar Cycle 24 prediction, what is apparent now could have been predicted a couple of decades ago in that it is a de Vries cycle event. The de Vries cycle is a 210 year cycle. The last one was the Dalton Minimum which started in 1798. The current minimum started right on schedule exactly 210 years after that. In the last 2,000 years, the only time we missed out on a de Vries cycle event was the Medieval Warm Period. So it is about 90% reliable. To not have a de Vries cycle event now, we would have to be able to explain why this time that we live in is special. This is a not a special time in which the laws of physics and Nature are suspended, so we are having a de Vries cycle event. While a couple of individuals (Clilverd and Badalyan) made early and correct predictions of Solar Cycle 24 amplitude, nobody got the big picture view correct. While I am saying that, we are also due for a Bond Event. 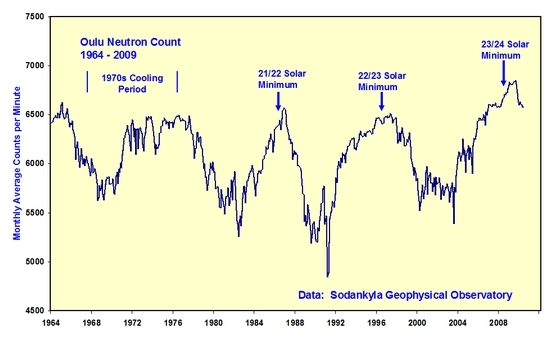 If someone was really good, he or she would be able to predict the shape of the Oulu neutron flux over the rest of this solar cycle (My fossil fuel interests have sidelined me – I am in the middle of drilling an oil well). With global cooling underway, and while waiting around for solar maximum, my own research interest has moved on to understanding the transition to cooling. A recent report on the Canadian wheat crop has it down 20% this year due to a cold and wet start to the growing season. This is consistent with my view that, by the end of the decade, Canadian agriculture will be reduced to trapping beavers, as it was in the 17th century. The transition to a severely cold regime can happen in one year flat. Brauer et al, http://geoweb.princeton.edu/people/sigman/paperpdfs/Brauer08.pdf , determined that the transition to the Younger Dryas occurred in 10,671 BC. The date they used was 12,679 BP. As their paper was published in 2008, I changed it to a fixed date. The year of transition was preceded by 21 years of sometimes bad winter weather, but otherwise there was no gradual transition. It was a rapid regime shift. We are now headed into the third cold northern winter in a row, so perhaps there may be only 18 more winters before the climate is set up for a rapid regime shift. As Brauer et al note, there is a strong negative feedback from sea ice. Last winter, some English people were astounded by a patch of sea ice that grew out from the local beach. That may have been the harbinger.